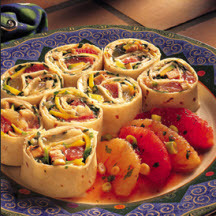 Served with a refreshing grapefruit salsa, these zesty pinwheels are sure to delight. Mix softened cream cheese with jalapeno chiles, orange marmalade, green onions and parsley. Spread mixture on middle of flour tortillas, making sure to leave at least 1/2 inch around edge. Top with several thin chicken strips. Top with avocado and shredded spinach. Top with dollop of salsa. Cut tortillas into 1 inch slices. Arrange on plate and garnish with Florida citrus fruit. Recipe and photograph courtesy of the Florida Citrus Commission.